There may be no literal superlative of mountain biking enthusiasm, but the Delite mountain will show you what it looks like. Every performance-driven rider will be amazed by the incredible dynamics of the high-torque Bosch Performance CX motor. 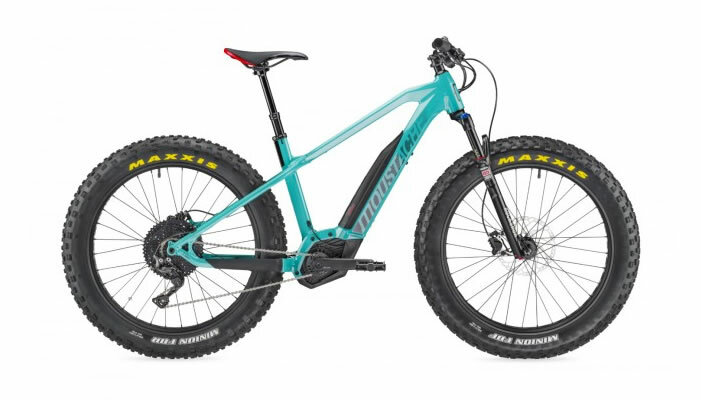 Along with the battery and shock absorber, the motor is installed in a particularly low and central position, allowing a level of handling that was previously only possible with un-motorised mountain bikes. Thanks to Control Technology with full suspension, the Delite mountain can conquer any terrain. And by the time you experience the superb traction – even at low speeds – you’ll be lost for words. As Canada’s largest Riese & Muller dealer, we have a large quantity of R&M eBikes in stock for immediate sale. 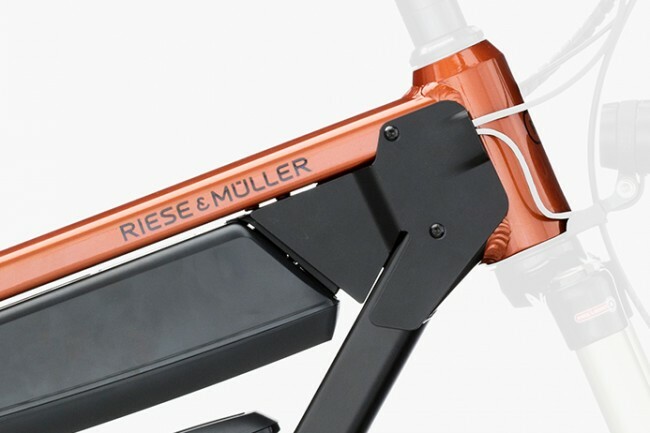 Please contact us for details of the Riese & Muller eBikes we have in stock. You can pick up your dream eBike here in Ladysmith, or we offer free shipping to most locations in Canada. If we don’t have the model or colour in stock you are looking for, it can be custom made for you in Germany. You can find out more about this process here. A challenge for every mountain. There may be no linguistic superlative of off-road biking enthusiasm, but the Delite GX will show you what it looks like. Every performance-driven rider will be amazed by the incredible dynamics of the high-torque Bosch motors. 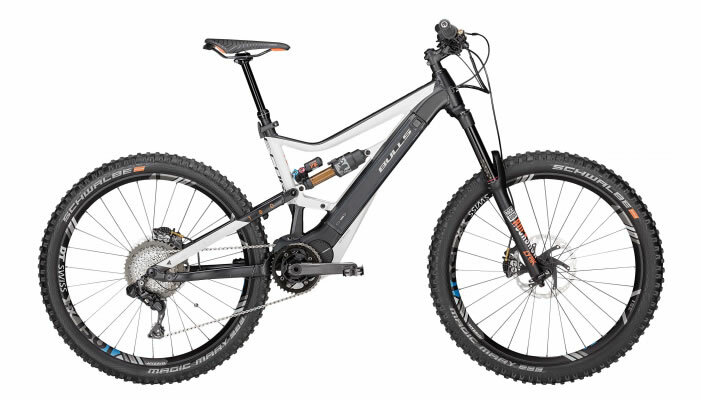 Along with the battery and shock absorber, the motor is installed in a particularly low and central position, allowing a level of handling that was previously only possible with un-motorised mountain bikes. Thanks to Control Technology with full suspension, the Delite GX can conquer any terrain. And by the time you experience the superb traction – even at low speeds – you'll be lost for words. You can master any mountain with the extremely robust, low-maintenance electronic Rohloff E-14 14-speed hub gear with a massive gear range up to 520%. Shifting is possible while stopped, or while coasting and it will automatically downshift to the gear of your choice when you stop. With the electronic shifting, shifts take only 180 ms, and you can shift 3 gears at a time by holding the button down. Choose this option if you want a long lasting, reliable drive train with very little maintenance. Being able to shift while stopped or coasting is another important benefit. The Rohloff E-14 hub will save you money in the long run - you won't have to replace your cassette, chain and derailleur, and the chain will last a very long time. Electronic shifting is very fast and reliable - the indexing is in the hub, not the shifter, so it won't go out of index. The gear ration of 526% gives you an incredible climbing gear, as well as the ability to keep pedalling at higher speeds. The powerful lithium-ion battery attached to the frame has an energy reserve of 500 Wh. High reliability and a service life of 800 to 1,000 charging cycles make it a strong companion over hill and dale. 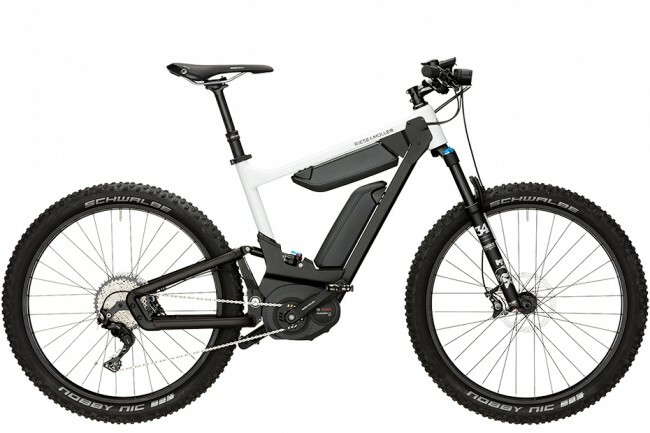 It can be charged directly on the E-Bike or removed from the frame in a single step. It takes 4.5 hours to charge from a fully discharged state. So with the PowerPack 500 you are perfectly equipped for any trip. 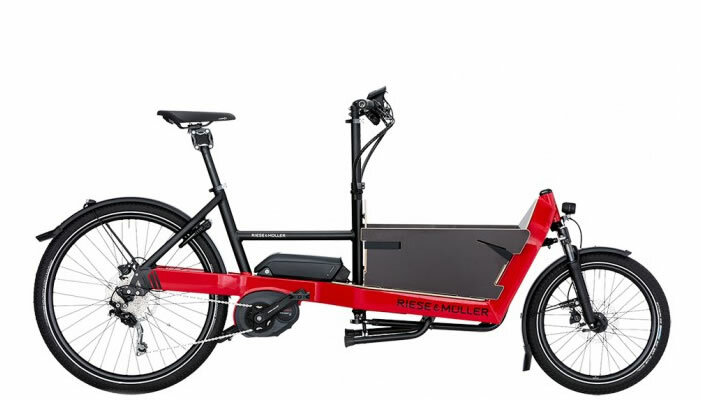 For long tours with lots of luggage or routes with considerable height differences, the DualBattery remains the benchmark. Riders using their E-Bike to commute to work also have to charge their bike less often. The load on the two frame batteries is minimised by means of an alternating load in 5 % increments, which significantly increasing the service life. Using the included Bosch Standard charger, both batteries can be charged directly on the bike or at any normal socket once removed. Both can even be charged together on the bike. The charging time for a single battery from a fully discharged state is only 4.5 hours. Charging them on the bike together, both batteries are fully operational again after 9 hours. It is also possible to use just one battery. 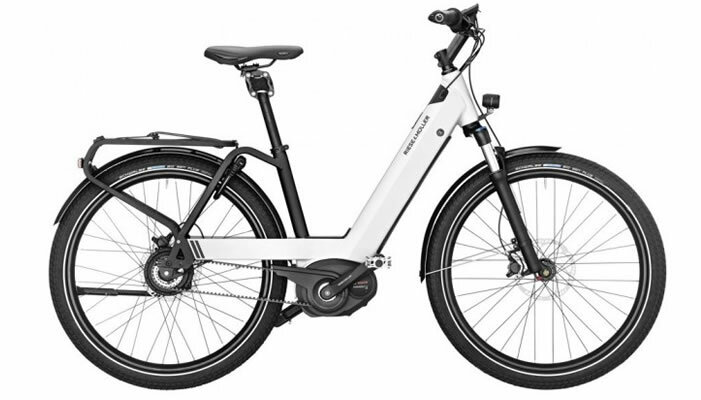 The Performance CX is the most powerful Bosch E-Bike motor ever – with pedal assistance of up to 300 %, a maximum torque of 75 Nm, very sporty start-up characteristics and pedalling rate assistance up to 120 rpm. With “Direct Flow” you have a powerful push on the back wheel from speeds of just 20 rpm. Whether it be uphill or on the flat, this acceleration will inspire you. Another highlight in the new Performance CX motor is the eMTB mode, which replaces the previous Sport mode (this is displayed as Sport mode on the Intuvia Display). Here, the progressive motor assistance automatically adapts to the individual riding style regardless of pedal pressure. This ensures optimum assistance at all times, which really pays off on climbs. 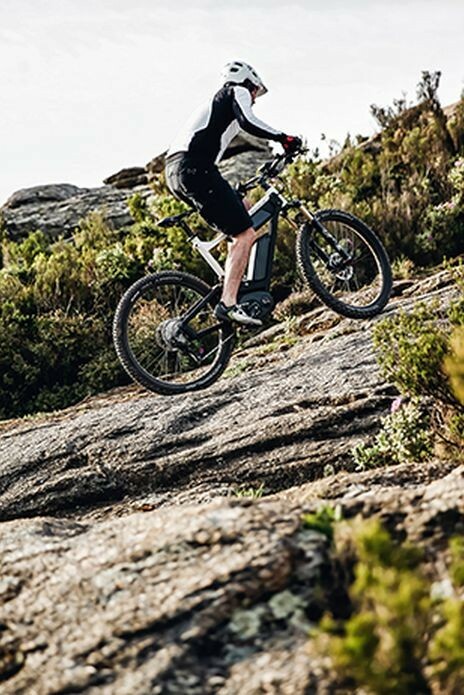 With the Bosch Kiox display, the E-Bike turns into the ultimate sparring partner for performance-driven riders. Various training modes and perfect handling, with special features such as tactile pressure points on the control unit, help you to continuously step up your performance. It is even possible to pair it with heart rate monitors via Bluetooth. The display made from scratch-resistant Gorilla Glass is easy to read in intense sunlight, while the magnetic holder ensures simple handling. The ultra-modern Kiox is small, robust, compact and ready for the E-Bike future. The Intuvia Display gives you full control and a perfect overview at all times. It provides information about battery status, range, daily mileage, total mileage, ride time, current motor power, time, speed and average speed – clearly legible in any level of sunlight. On our automatic E-Bike models, the automatic version of the display also offers an option for controlling the pedal frequency. A USB interface allows MP3 players and mobile phones to be charged while riding too. It is operated via a remote control conveniently mounted on the handlebar grip. Great safety, even at high speeds. Only an E-Bike with true full suspension consistently keeps ground contact even on poor roads – and keeps you in full control. The active rear wheel swing arm, optimised front wheel suspension and co-sprung luggage carrier form the core of the Control Technology. They ensure better road holding, sportier riding behaviour and safety even at high speeds and in tricky situations. Vibrations and hard knocks like those experienced on cobbles or kerbs are simply smoothed out. 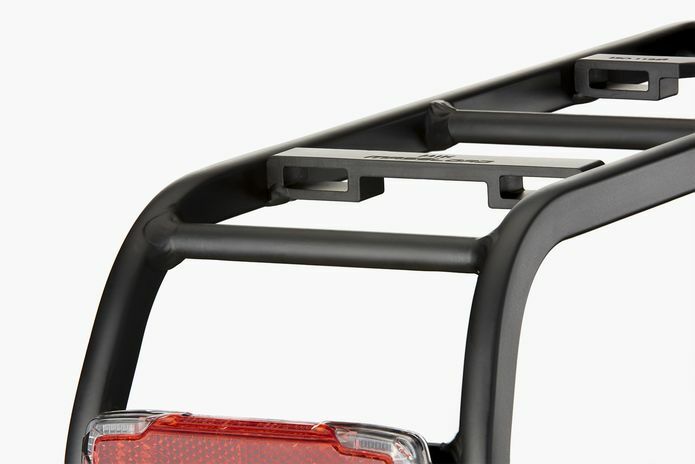 Your luggage is also protected by the frame-mounted, sprung luggage carrier. One saddle for all gradients. The enjoyment of electric biking is riding uphill – as well as traditionally downhill. A normal high saddle can be troubling here. The seatpost can be quickly lowered up to 100 mm by remote control on the handlebar to give you significantly better control of your Delite GX– especially on challenging terrain. With the optional ABUS Bordo 90 cm folding lock, the bike can be secured to virtually anything. It locks simultaneously with the battery lock, which means you only need one key for your E-Bike. 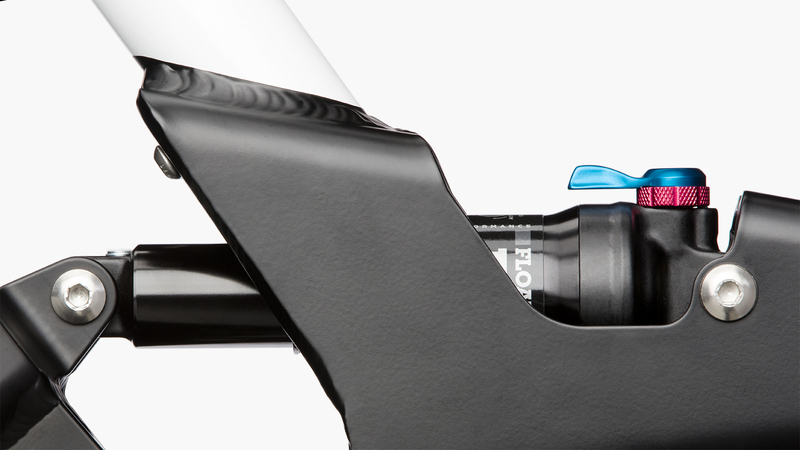 The E-Bike features two water bottles, but without a single holder attached. This technical feat is revolutionary. The front cover plate of the frame is equipped with two plastic pegs on each side, both left and right, specially designed for direct mounting of the cageless water bottles from Fabric. It doesn’t get any easier than this when it comes to keeping two bottles within perfect reach during a ride. 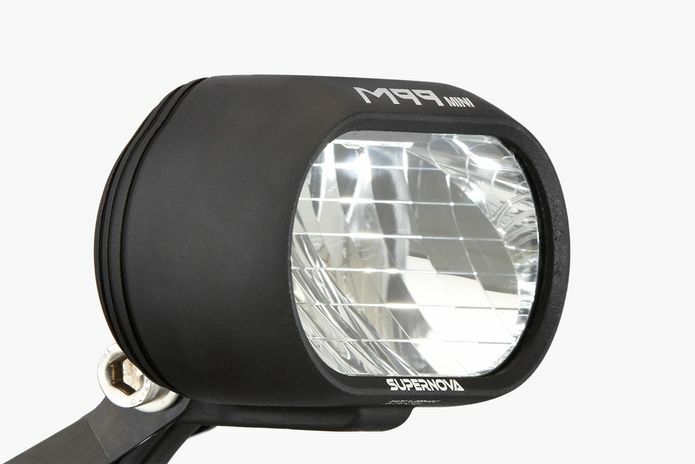 No more sudden surprises with the Supernova M99 Mini front light. An impressive 1,250 lumens illuminate the road in a way that previously only car headlamps could manage. And even the 600-lumen dipped beam is far brighter than most conventional E-Bike headlamps. On all 28 mph models and even all 16 mph models, the brake light is integrated in the rear light to ensure that you are even safer on busy roads. Rear shock Fox Float DPS Performance 3 Pos.